The Indian PM's popularity, particularly among young Nepalis, has hit a low. #BlockadeWasCrimeMrModi has been trending in the Nepali Twittersphere the last few days. Nepal’s new prime minister K P Oli has been in office since February 15. A leader with a mission as well as one backed by an unprecedented parliamentary majority, Oli has the political heft several of his predecessors never did. Oli is folksy, funny, charismatic, a grand orator who likes narrating stories. And he likes to make grandiose claims – not too dissimilar to Indian prime minister Narendra Modi who arrives in Nepal today. Ambitious leaders can simultaneously charm and antagonise the population. ‘Samridhi’ (prosperity) was Oli’s major campaign slogan last year, which saw the Left alliance led by him register landslide victories in elections to the provincial assemblies and the federal parliament. ‘Samridhi’ continues to be his key slogan even after he became prime minister. One story about him that has become a big hit in social circles here in Nepal — including on social media — is that he wants Nepal to have a shipping fleet that carries its national flag. Never mind that Nepal is landlocked and that the Indian port Nepal uses for its trade, Kolkata, is hundreds of km away. In fact, the ports of an increasingly friendly China are even farther away–across the Himalayas and the rugged Tibetan plateau. Perhaps that makes Oli an eccentric leader. He is certainly not the only one, nor the first. 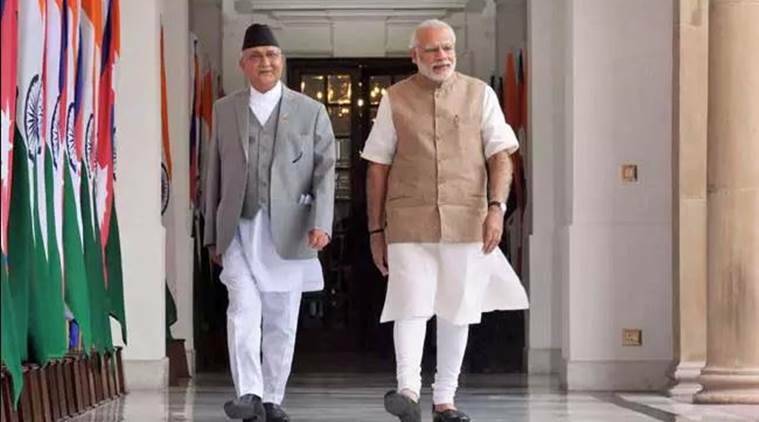 So when Modi arrives in Nepal, only a month or so after Oli visited New Delhi to meet the Indian prime minister, it seems that another episode of their ‘bromance’ will break out; both leaders seem anxious to strike a personal rapport. Despite their differences, they have a lot in common. Both have strong majoritarian streaks, both carry ambitious agendas of development and prosperity and both are infamous for their lack of affection for marginalised people. Yet it will be their differences–and what the visiting Indian Prime Minister does to iron those out– that will be closely watched during his visit. Modi will be closely followed for various cues. One thing is crystal clear: When Modi first visited Kathmandu in 2014 as prime minister, he had a clean slate to begin with and Nepalis welcomed the humble leader from Gujarat with strong Hindu leanings with open arms. When Modi addressed Nepal’s parliament, all of Nepal watched him with love and respect—seldom bestowed on a foreign leader, not least one from India. Nepal was swept away by Modi mania. Two years and a border blockade later, he re-enters Nepal as a far more complex figure. His popularity particularly among the young Nepalis has hit a low. #BlockadeWasCrimeMrModi has been trending in the Nepali Twittersphere the last few days. There has been no official statement yet from the Nepali side about the bilateral agreements that are to be signed. But the two sides are expected to agree on specific proposals to operationalise three major agreements signed during Prime Minister Oli’s visit to India last month—development of inland waterways, the development of the Raxual-Kathmandu railway and Indian assistance to increase Nepal’s agricultural productivity. Reducing the food import bill from India, at Rs 200 billion in 2016-017, is a top concern. Though Nepal is still a ‘food surplus’ country, its agricultural productivity is the lowest in South Asia and huge swathes of cultivable land remain fallow. The mass migration of the working population to the Gulf and East Asia and haphazard urbanisation have taken a heavy toll on the predominantly agrarian society. GDP growth remains heavily dependent on a favourable monsoon. The two prime ministers will jointly lay foundation of the 900MW Arun III hydropower project. Again it’s important that New Delhi ensures its timely completion. A key assurance for many foreign investors willing to invest in Nepal’s hydropower is whether India will buy electricity from Nepal. Equally, people are anxious to see that the old India-funded projects completed. New Delhi has to be particularly mindful of the fact that there is a strong perception in Nepal that Indian development projects move at a snail’s pace—the Postal Road connecting the southern Tarai is a case in point. A joint communiqué expressing its commitment to expedite old projects and three new agreements signed during Oli’s visit last month will make a huge political statement to allay the deep-seated anxieties. Modi’s first port of call is Janakpur, the capital of Province 2, the only province (among Nepal’s seven provinces) where the Chief Minister comes from a Madhesi party, and not Prime Minister Oli’s Left Alliance. So the political symbolism of the visit is not lost. Though the Tarai-based Madhesi parties seem irked by the growing Oli-Modi ‘bromance’, Province 2 leaders seem buoyed by the high-profile visit. As much as the ongoing facelift to Janakpur, the leaders of the Province are keen to see what will happen once Modi returns to Delhi. Indeed, the Indian PM needs to tread a very fine line between Janakpur and Kathmandu. It is no secret that India will struggle to match the financial impact created by proposed Chinese investments in the infrastructure space in Nepal. Perhaps that is why India prefers to emphasise its socio-cultural ties with Nepal since time immemorial. Modi’s visits to important Hindu shrines—Janaki Mandir in Janakpur and Pashupatinath in Kathmandu as well as the remote mountain temple of Muktinath in the high Himalayas—will showcase the fact that vast numbers of Nepalis and Indians share similar traditions and worship the same gods. Two new international airports being constructed in Nepal—in the lake-city of Pokhara and in Bhairahawa (next to Lumbini, Buddha’s birthplace)—will mean that India must provide Nepal with additional air routes to make them commercially viable. In being seen as an open and friendly neighbour, India will most definitely see its ‘soft power’ deepen in Nepalis’ hearts and minds. As during Oli’s visit to New Delhi last month, neither side is expected to mention China, including in the joint communiqué. But China’s growing presence in Nepal and South Asia is a new fact of life and the Nepalis — just as other South Asians — would like the Indian foreign policy establishment to internalize this geopolitical transformation. Soon after his visit to New Delhi last month, Nepal’s Foreign Minister Pradeep Gyawali flew to Beijing where he met the Chinese Foreign Minister Wang Yi. Wang expressed strong commitment to help meet Nepals’s (and Oli’s) goals for rapid development. Nepal and China have agreed (though no specific time-bound documents are signed yet) on developing a cross-Himalaya connectivity network—of railways, roads, airports and communications. Interestingly, Wang stressed that Nepal stands as “a natural beneficiary of cooperation and development by China and India” and trilateral cooperation would benefit all three neighbours. Hopefully, the highs and lows on the relationship barometer have given Modi a peek into Nepali sentiments: We take Modi seriously as long as he takes us seriously. The idea now is to transform the age-old multifaceted bilateral relationship to a dynamic one where Nepal feels that it is treated with the respect a sovereign nation deserves and that the relationship results in tangible benefits. Let’s us not just gloat over our “special ties” defined by shared cultures and values. That gloating has runs its course. Let’s look to redefine ties that embody our growing aspirations.